Hi All! Welcome to day 2 of Stamp Highlights as we take a look at THREE AMIGOS! It is such a fun set! 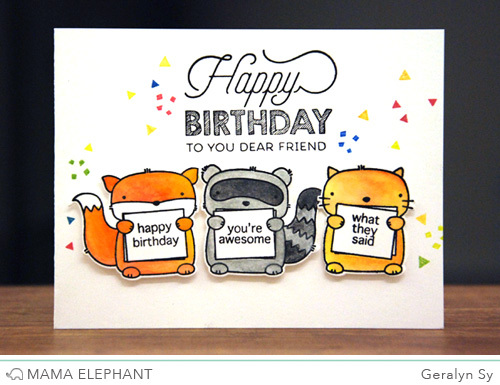 Geralyn created a cute and festive birthday card with Three Amigos. We love how she colored them in with watercolors and added lots of confetti using the stamps from Confetti! Elena stacked the Three Amigos on this soft and playful card. We love that each amigo is grounded by the stitching line die, and the Borderlines Trio die cut detail on the left is pretty times two. Pamela created a fun Valentine's Day card. It seems like Mr. Fox made some errors before getting the sentiment correct! 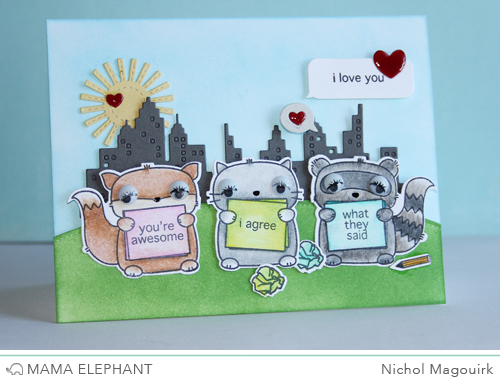 Nichol created a scene with all Three Amigos complete with a Cityscape skyline, sunshine and thought bubbles. That's all for today! Come back tomorrow for more! SO ADORABLE!!! Definitely my favorite :) I can't wait to get them. LOVE this set! I can't wait to play with it!! 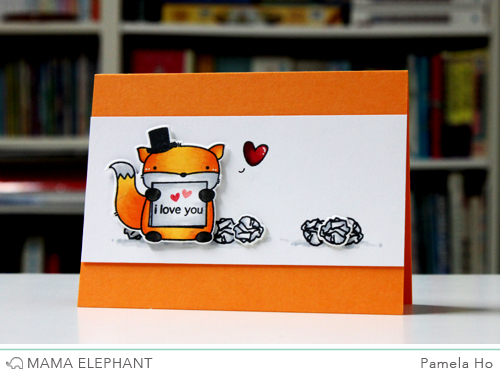 Eeek these cards are all super adorable! Wonderful showcase of this new set...cute cards, ladies! This set looks like so much fun. I cannot wait to get it and play. how cute...love that you can customize their little messages. these little guys are so cute. Have to have them. Such adorable cards using this precious set! This is another ME must-have set! These amigos are so cute. Love those 3 amigos! So many ideas to be created!